A hundred and ten years later Kelly Speer, a grad student at AMNH, generated a spreadsheet documenting bats that had been collected throughout the Bahamas, including those collected by G.M. Allen. 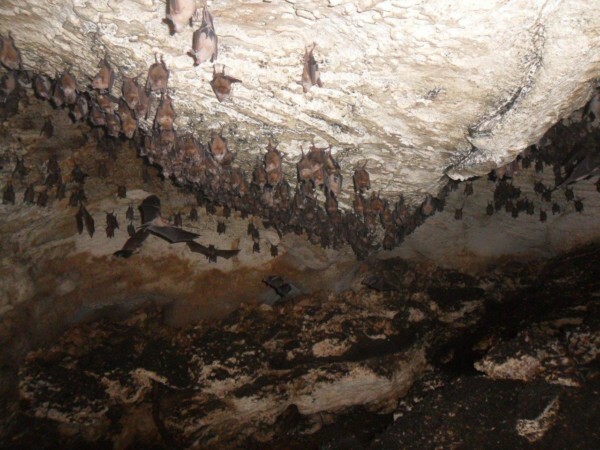 When she asked us to help with pinning down the locations shown on her spreadsheet, we noticed that Allen had found Chilonatalus tumidifrons – a rare endemic bat found only on Abaco, Andros, and San Salvador – in Israel Point Cave, “7 miles north of Marsh Harbour”. We have been caving in the Bahamas for over a decade, but we had never heard of a cave in that area, let alone one with Chilonatalus in it. 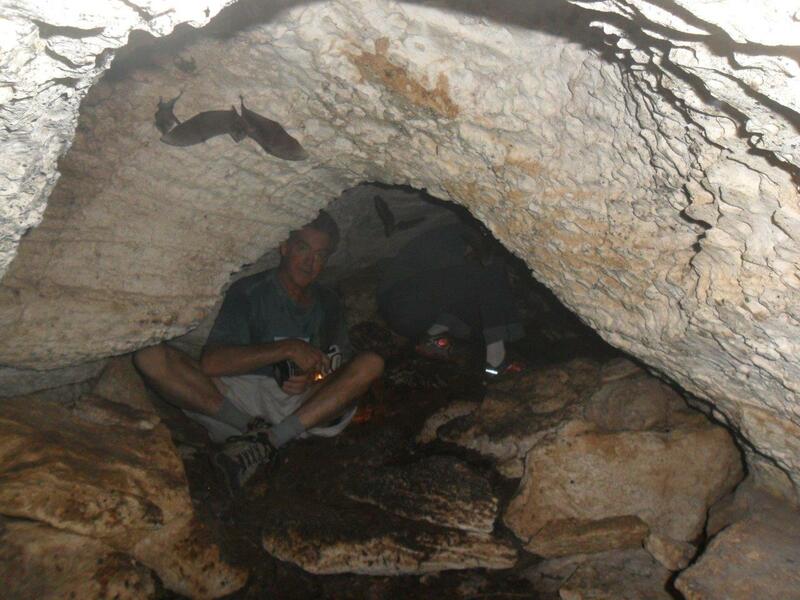 We had already found two “lost” caves on Cat Island, and we were determined to find Israel Point Cave as well. We tracked down G. M. Allen’s report of his expedition (Biological Society of Washington, Feb. 21, 1905), which had a good description of the cave itself, but there was no GPS in 1904, so the exact location was still unknown. We learned that there had been a pineapple plantation nearby, and that the bat guano from the cave had been used to fertilize the pineapples. We could find no mention of an Israel Point anywhere on Abaco, but an old map showed an Israel Hill in the right area. 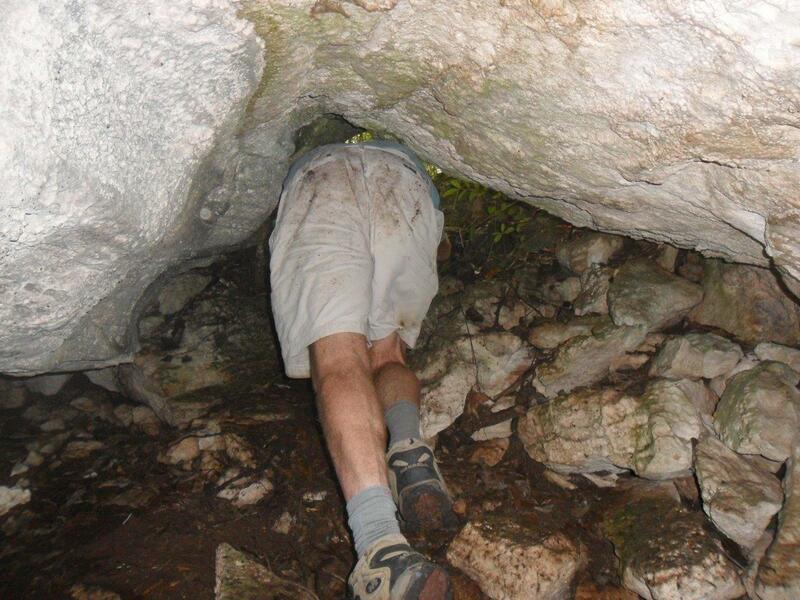 Nobody in the area knew anything about a cave. Then Nancy Albury talked to a local fisherman who said yes, Israel Point was right there by Israel Hill. At this point there was no further research to be done. There was nothing for it but to load up with water, granola bars, GPS, and headlamps, and start blundering around in the bush looking for the cave. Luckily, our caving buddies Bruce, Amy and Nan were on Abaco and eager to help. The first day, we walked along the shore to Israel Point, then went into the bush and spread out to try and walk a grid. It was very “cavey” ground, with lots of sinkholes and one small but bat-free cave, but we had no luck finding the cave we were looking for. On the second day, we decided to go further along the shore before turning inland. 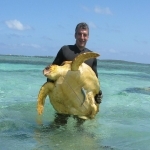 Within minutes, Bruce had found a likely hole, but he said it must be connected to the sea, because he could hear the waves inside. What he was actually hearing was bat wings. Hundreds of them. We had found Israel Point Cave. 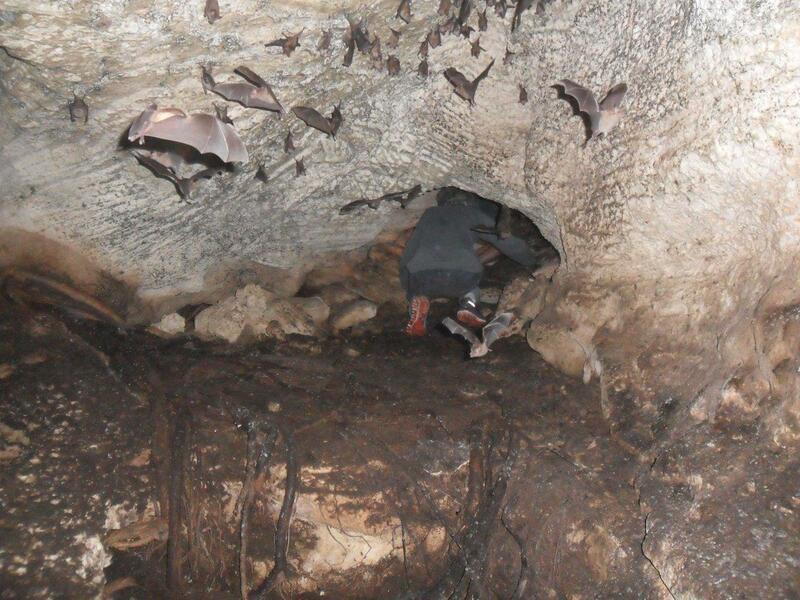 The cave was quite small, and contained about 500 bats, along with a corresponding amount of guano. Disappointingly, the bats were not the Chilonatalus that we had been hoping for, but just plain old Erophylla sezekorni. (G. M. Allen’s notes indicate that all the Chilonatalus he collected were male, and that on a subsequent trip to the cave he found only Erophylla there. So we are hoping that the Chilonatalus may still be using the cave as a bachelor roost in the summers.) But we were thrilled to find a cave that had last been reported over 100 years ago.